December 14, 2017, Mundgod, Karnataka, India – The commanding buildings of the new Drepung Loseling Meditation & Science Center faced with red laterite stand in their own 11 acre compound beyond the Drepung Loseling campus. When His Holiness the Dalai Lama drove there this morning from Drepung Lachi Monastery, the road was lined with Tibetans eager to greet him as he passed. At the door to the Center http://www.drepung.org/ His Holiness cut the ceremonial ribbon and recited auspicious verses, tossing handfuls of flowers and grain into the air as he did so. Once inside, he lit the lamp and on the other side of the room pressed the button that launched the Meditation & Science Center’s new website. He was escorted around the Center’s science exhibition. At each installation to demonstrate a key scientific principle, such as gravity, electromagnetism and the laws of light and optics, there was a clear written explanation in Tibetan. There were also articulate monks on hand to explain what was being demonstrated. Four hundred monks and nuns, teachers, staff and supporters sat in a covered space shaped like an amphitheatre. Geshe Yeshi Kelsang welcomed His Holiness and other dignitaries and guests. Gelong Thubten Tsering, Co-Director of the Science Project, introduced the Center in the absence of Geshe Lobsang Tenzin who was teaching elsewhere. He explained that Drepung Monastery preserves the classic tradition of studying ancient India’s ten major and minor sciences. Since 2009 modern science has been added to the curriculum. Because an understanding of mathematics and English is a precondition for such study, opportunities have been provided to learn them too. Consequently, 400 students have taken up these subjects at the instigation of Geshe Lobsang Tenzin and participate in the Emory Tibet Science Initiative, the unique project developed by Emory University, Drepung Monastery and the Library of Tibetan Works & Archives in Dharamsala. The Abbot of Drepung Loseling welcomed His Holiness and the other guests. He explained that it is largely due to His Holiness’s encouragement that Tibetan monasteries have taken an interest in the study of science. Since 2016 this has been formally incorporated into the curriculums of the three major monasteries of Drepung, Sera and Ganden. He said that while keeping in mind the importance for human happiness of inner values such as love and compassion, by also exploring the world of modern science, here at Drepung Loseling they are trying in a small way to fulfil His Holiness’s vision. 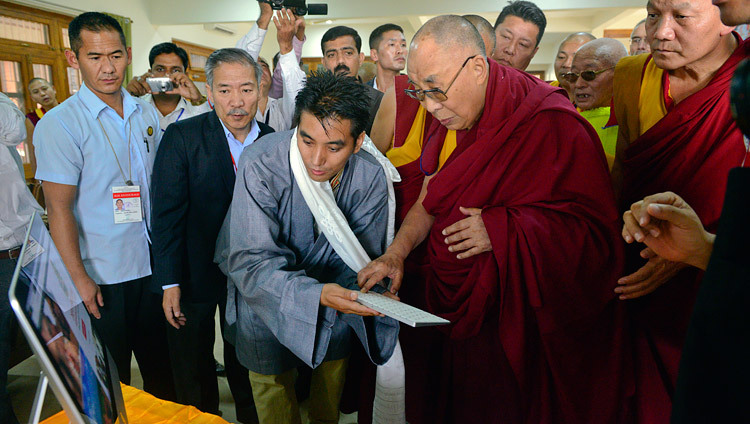 He concluded with prayers for His Holiness’s long life and the accomplishment of his wishes. His Holiness began his remarks by expressing his deep appreciation of Drepung Loseling Monastery’s creating this Meditation and Science Center, a place where modern science can productively interact with science and philosophy that has its source in ancient India. “This isn’t a short-term initiative but a long-term project. I’d like to thank Emory University and everyone else who provided support for this valuable endeavour. “There are 7 billion people in the world and all of us want to be happy and avoid distress. And yet we see reports of incessant suffering, people killing each other, others dying of starvation. We need to take responsibility for seeing what can be done to help. “In many places there has been great progress in education, but education focussed solely on material development, to the neglect of the factors like love and compassion that give rise to inner peace, is inadequate. Today, we even hear of religion being used to divide ‘us’ and ‘them’ and as an excuse for other negative behaviour. “At the beginning of the 20th century there was little talk of world peace. However, after a series of wars and the development of hugely destructive weapons, by the end of the century attitudes had changed. People became aware that there was no need to go on fighting. They aspired instead to achieve world peace. In Europe, for example, historic foes like France and Germany decided that it was better to work for the common good and launched what became the European Union. “More and more people have come to understand that you can’t create lasting peace through the use of force. There needs to be a new approach based on peace of mind. Therefore, it’s necessary to identify the factors like pride, anger and jealousy that disrupt such inner peace and take steps to counter them. We need to observe an emotional hygiene that corresponds to the physical hygiene with which we protect our physical health. Creating peace of mind doesn’t involve building temples or monasteries, but working with the mind. “Thinking of others being intrinsically existent gives rise to mental afflictions on the basis of which we engage in negative conduct. In the traditions of ancient India we find the practices of single-pointed concentration and penetrative insight and on the basis of those I think we can discuss the workings of the mind in a secular way. I hope Indian scholars can participate in such discussions, but many contemporary Indians are more concerned with material rather than inner development. 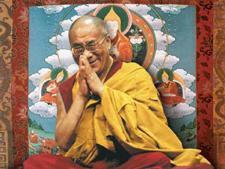 His Holiness spoke of scientists’ ever increasing knowledge of how the brain works. After mostly paying attention to sensory consciousness, scientists have lately begun to take more interest in mental consciousness. Many now recognise, for example, that meditation affects neuroplasticity. He expressed satisfaction, therefore, that this new center includes mediation along with science. He cautioned that it’s necessary to distinguish between what science has proved not to exist and what it has not yet proved to exist. Just because something is not openly visible is not sufficient to deny its existence. At the same time he urged those who follow the Buddha to be 21st century Buddhists, relying not on blind faith but on understanding soundly based on reason. His Holiness recalled Mao Zedong telling him he had a scientific cast of mind only to spoil the compliment by confiding that religion is poison. He joked that he likes to think that if Mao were still alive he could convince him to make an exception for the Nalanda Tradition.